As an instructor, you can import SCORM (Sharable Content Object Reference Model) lessons to any classroom that you are part of. 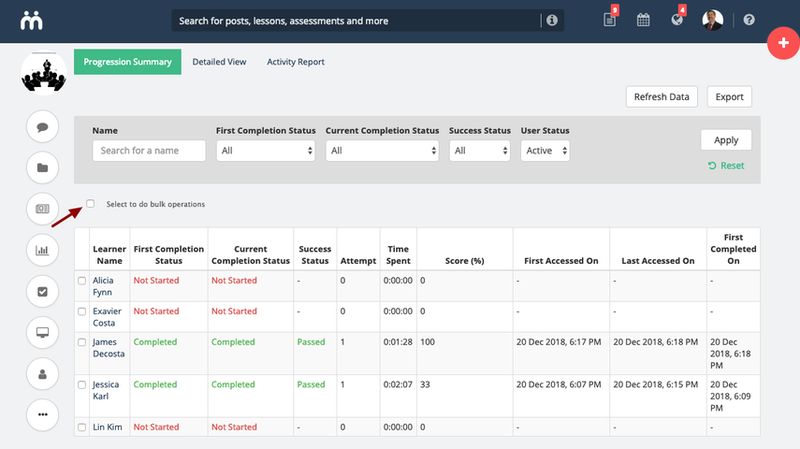 Like any other Teamie lesson, you will be able to make the SCORM content available to the students, set a deadline, view their progress, scores, number of attempts made and time spent on the content. 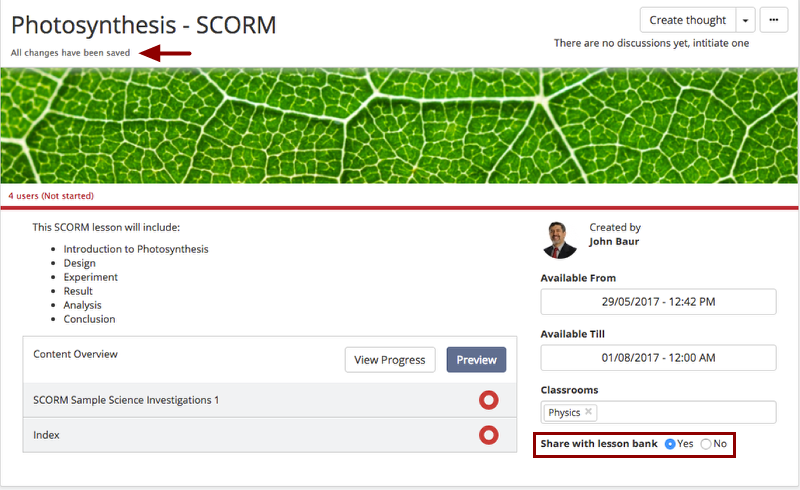 In addition, you can also share a SCORM lesson with multiple classrooms. 2. 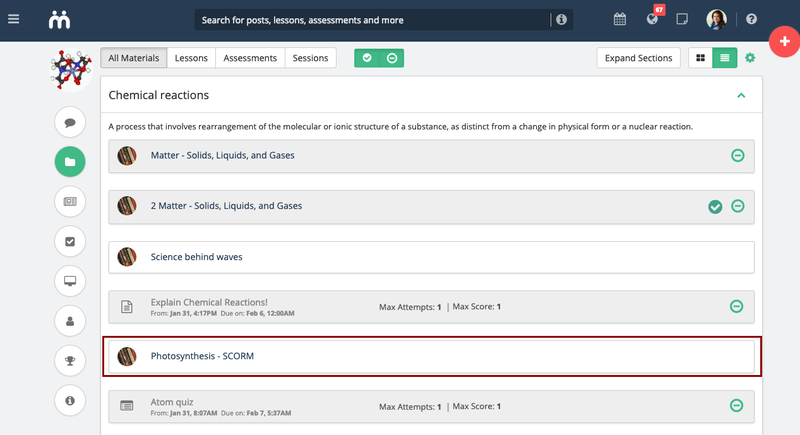 On the Materials page, you have the freedom to add a new SCORM lesson at any desired location. For example, it can be at the top, in between two resources or right below the last item displays, a +Add link which gives you the flexibility to add SCORM lesson at the corresponding location. 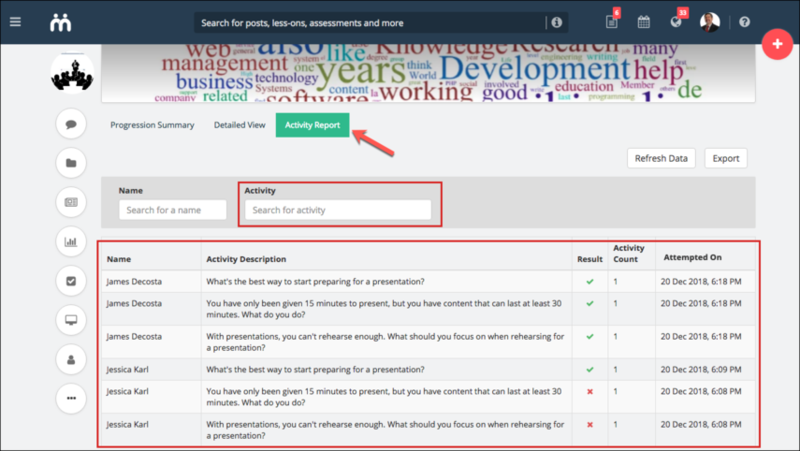 Click it at the desired location to create a new SCORM lesson at that location. 3. 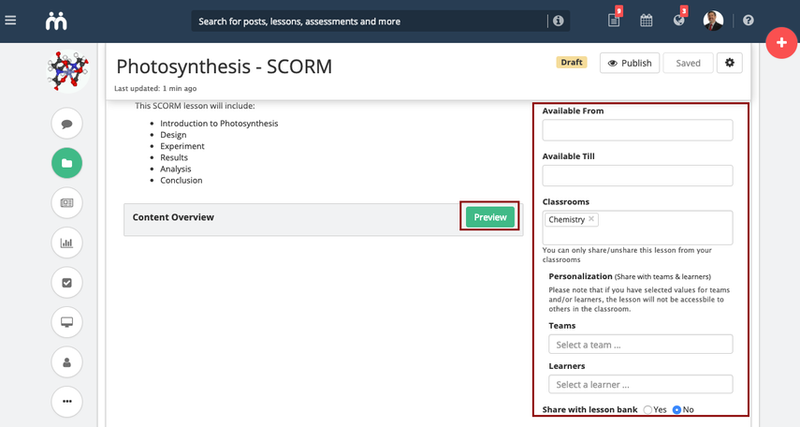 Select Create SCORM Lesson. 4. Create Lesson window opens. Add the details. 5. 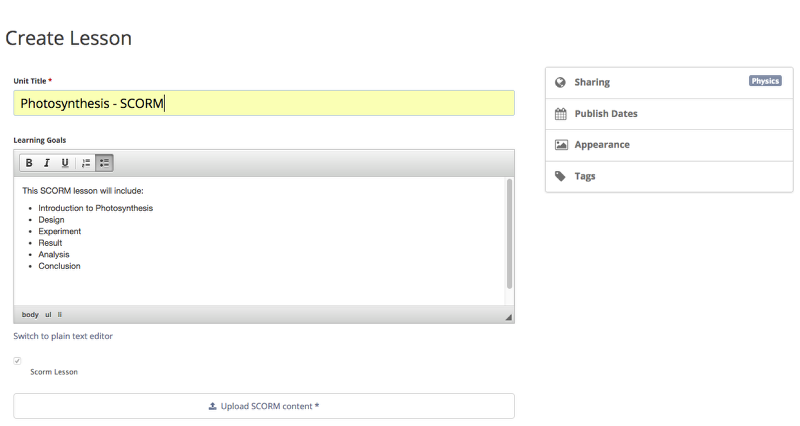 Click Upload SCORM content at the bottom of the window and upload SCORM content. Allowed file type is .zip (its size should not exceed 100 MB). 6. Select the SCORM zip file and click Open. 7. Choose the lesson settings as required and Click Save. Note: You can also change the lesson settings after creating the SCORM lesson. 8. 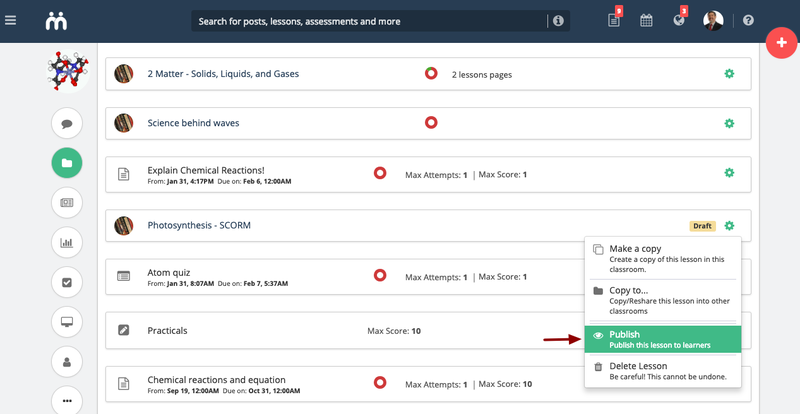 The full screen popup will get dismissed and you will be able to see the SCORM lesson on the materials listing page at the spot where you had clicked the "Add" link. Note: The newly created SCORM lesson will be in draft mode. You need to publish it for the learners to access. 1. Add a SCORM lesson. 2. 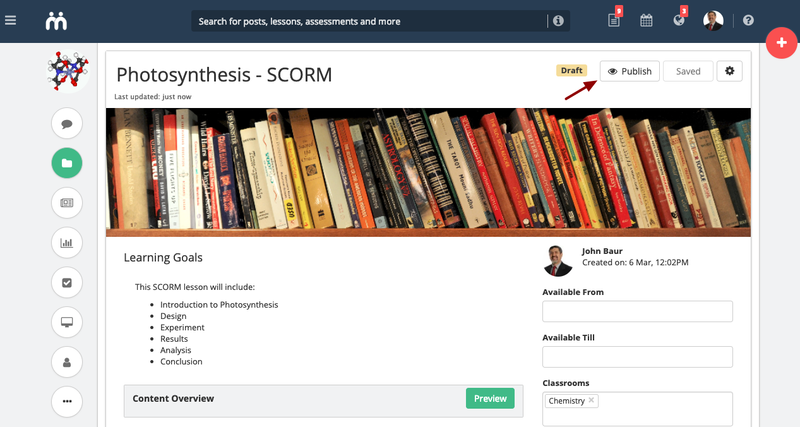 Click the gear icon next to the Draft label for the required SCORM lesson that you wish to publish. 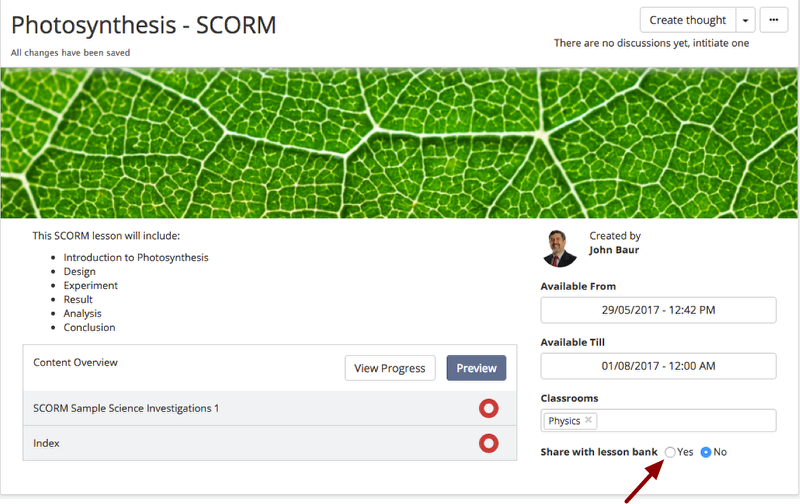 Then select Publish icon to publish the SCORM lesson. 3. 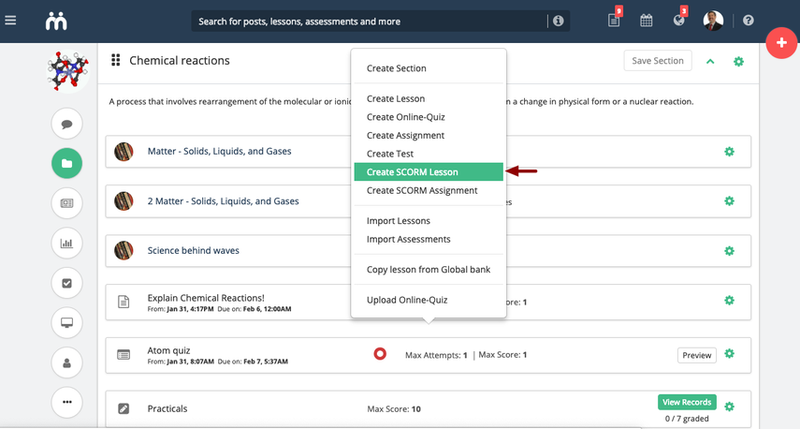 You can also click the lesson title to open the SCORM lesson and then click Publish on the SCORM lesson landing page to publish the SCORM lesson. 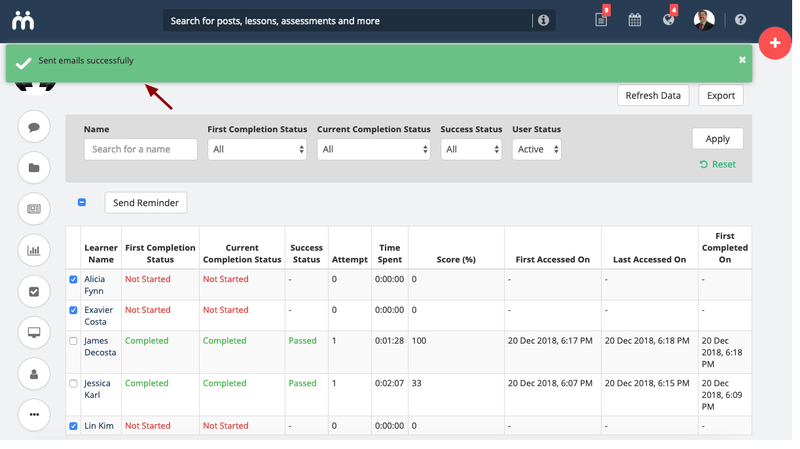 You can also change the SCORM lesson settings, such as its availability/available till date, the classrooms it is shared with, and share it with the lesson bank from here. 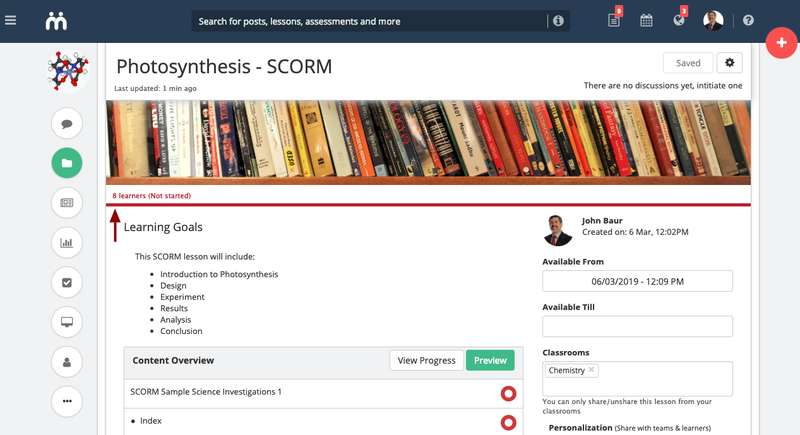 Click Preview to see how the SCORM content will look for the learners. 4. 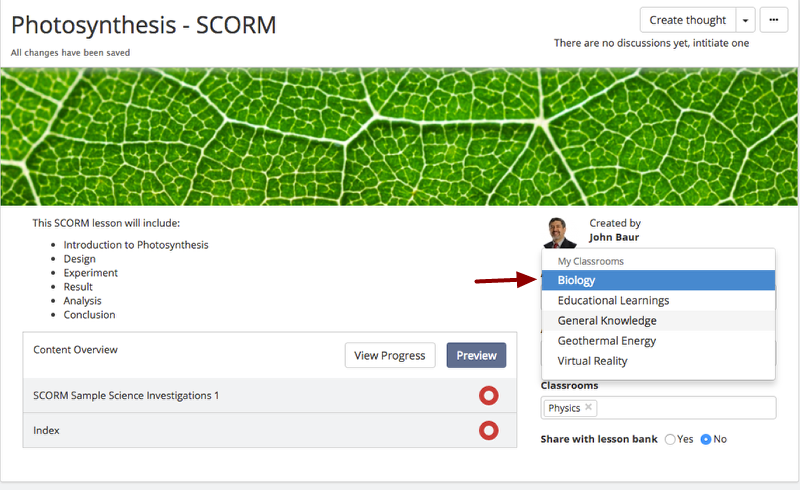 Once you publish the SCORM lesson, you will be able to see the learners' progress. 5. 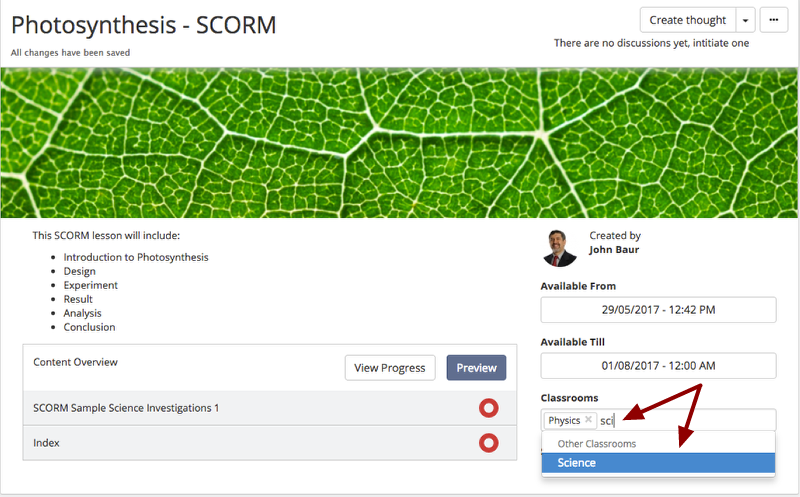 Learners will be able to access the SCORM lesson from the classroom's Materials view page, once it is published. 2. 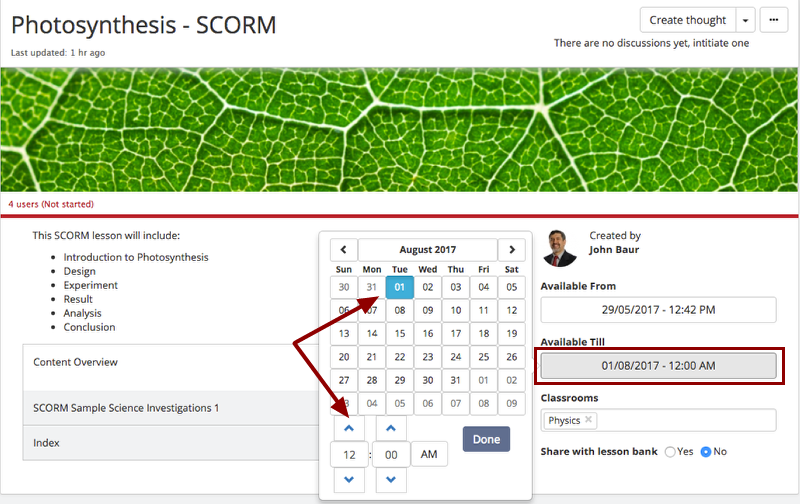 In the expanded view, click Available From field and select the required date and time from which the SCORM lesson will be available for learners to read. 3. 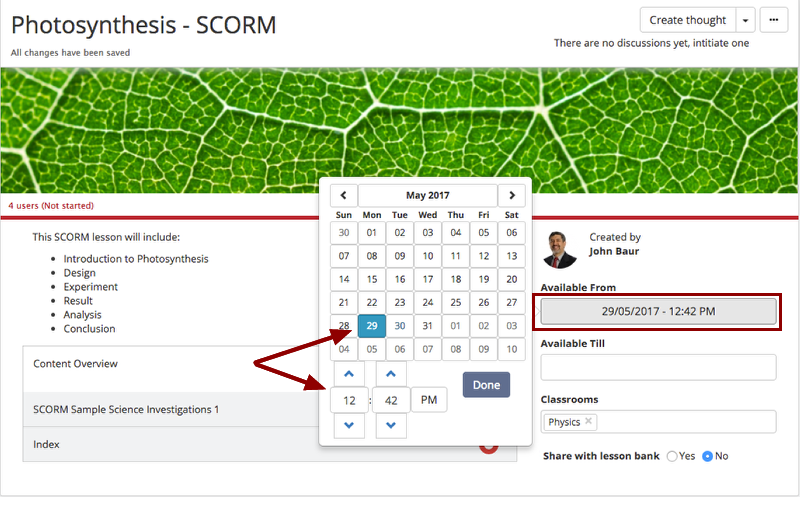 Similarly, click Available Till field and select the required date and time till which the SCORM lesson will be available for learners to read. You may choose to share your SCORM lesson with multiple classrooms that you are member of, while adding a new lesson or while editing an existing lesson. The shared SCORM lesson will be available for readers in all the classrooms it is shared with after it is published. 2. In the expanded view, click the classrooms field. 3. You will see a list of classrooms that you are member of. Select the classroom(s) you wish to share your lesson with from the drop-down list. The lesson will be shared with the selected classrooms. As always, your progress will be auto-saved. 4. In case you wish to share a lesson with classrooms that you are not member of, then you would be required to have "Share with any classrooms" permission. Once you have this permission, start typing the classroom name with which you wish to share your lesson. 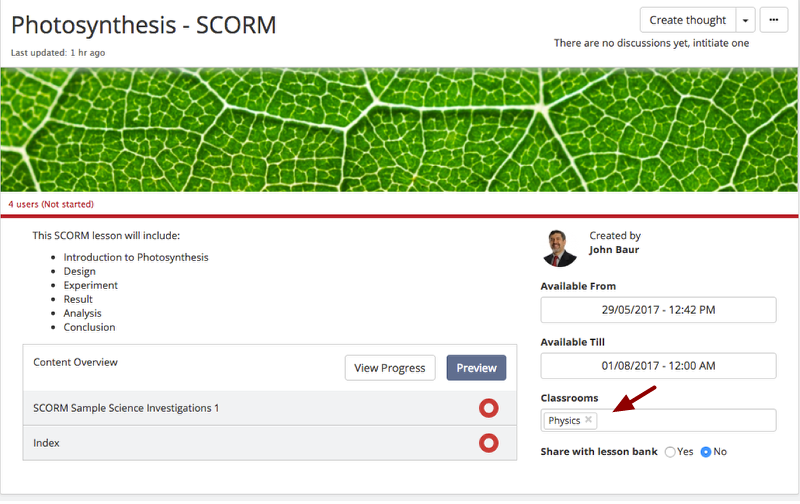 You can also share the SCORM lesson with particular learner(s) or a team of learners. See personalised learning. The Lesson Bank is one place to find all the lessons (including SCORM lessons) that are made public. Within a given classroom, it is an easy way for instructors to share SCORM lessons among themselves. This way instructors can simply go to lesson bank and copy the desired lesson and then make modification to it, without affecting the original lesson. 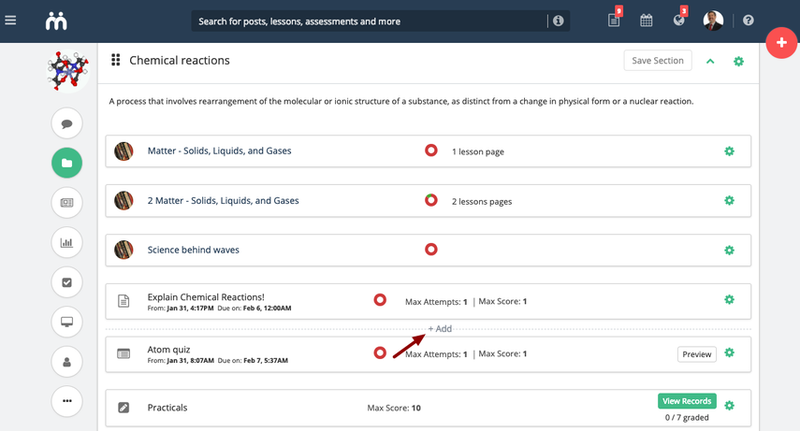 Teamie creates a copy of that lessons and the instructor can make modifications to it, without affecting the original lesson. Let's see how you can share a SCORM lesson to the lesson bank. 2. In the expanded view, click Share with lesson bank radio button to share the lesson with lesson bank. 3. The changes will be auto-saved and your SCORM lesson will now be available in the lesson bank. It can now be reused by other instructors in their classrooms. With the help of list / card view, you can quickly view how many learners of the classroom has completed the SCORM lesson. 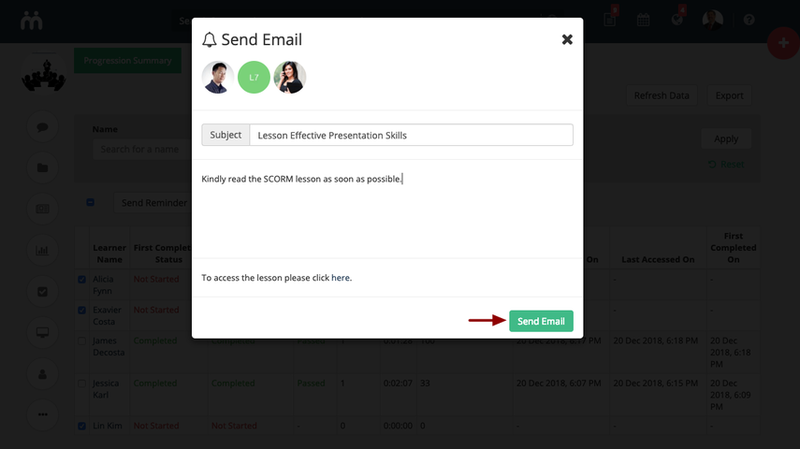 You can also view the learner who have not yet started reading the lesson or are in progress (who have read a few pages of the SCORM lesson) and send email reminders to them. Let's see how you can do this. 1. 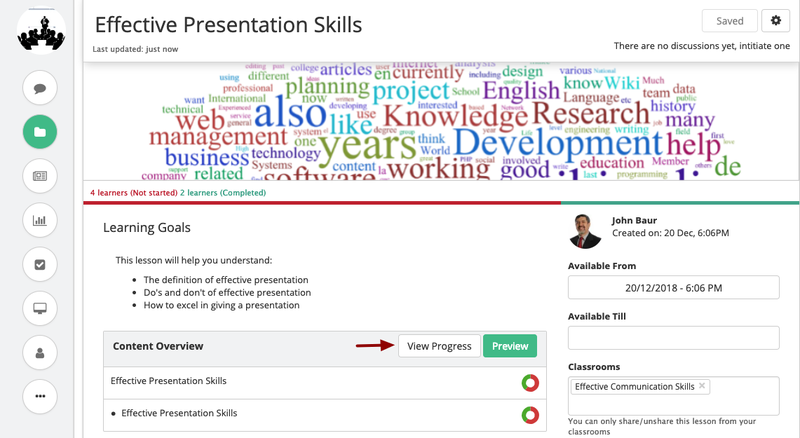 On the Materials page of the required classroom, hover over the donut chart of the required lesson. You will see the number of learners who have not started reading the lesson, number of learners who are in progress, and the number of learners who have completely read the SCORM lesson. 2. Click the donut chart to view the list of learners along with their lesson reading status. 3. You can also click the reading progress bar (in the card view) instead of the donut chart to view the list of learners. 4. The list of all the learners will be divided into three categories: Completed, In Progress and Not Started. Click Send Reminder corresponding to Not Started / In Progress to send reminder to the learners who have not yet started reading the lesson or are in progress. 5. A Send Reminder box opens. The Subject and reminder body field will be pre-filled with the necessary details to send a quick reminder. You can edit it as per your convenience. The reminder body will also contain the link for learners to access the lesson directly from the email reminder. Click Send Email to send the reminder. 1. In the lesson expanded view, click View Progress. First Completion Status: Whether learner has completed the SCORM package at least once. Once the learner completes the SCORM package, then the First completion status will be listed as Completed, regardless of the current completion status. Also, users lesson completion stats (bar/donut) is based on their First Completion Status and not the Current Completion Status. 3. You can also use the filters to search for the particular learners on the basis of their names, first completed status, current completion status, (Not Started, In Progress, Completed), success status, and their User Status (Active / Blocked). You can use these filters in combination or one at a time. On the detailed view of a SCORM lesson, you can view the details of the SCOs (SCORM pages) along with current completion status, success status, attempt and score. 2. You will be taken to the Progression Summary page. Click Detailed View. 3. On this page, you can view the details of the SCOs (SCORM pages). The detailed view will show SCOs row-wise for better readability and easier filtering. The SCOs will be listed in bullet points under their respective headings under the Topic column. The Detailed View page table will have the Name, Topic, Current Completion Status, Success Status, Attempt, and Score columns. 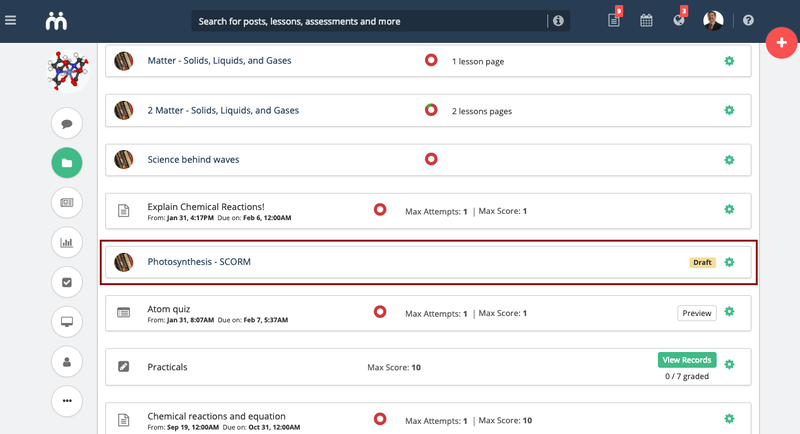 A nifty Topic filter is added on the page to quickly filter the topics of the SCORM for different learners. On the activity report view of a SCORM lesson, you can view the activity description, result, activity count and attempted on time for the activity. 2. You will be taken to the Progression Summary page. Click Activity Report. 3. 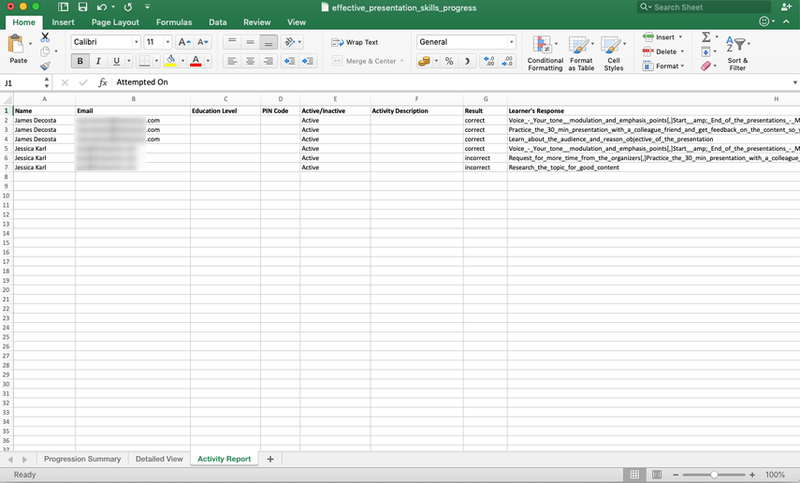 The Activity Report page will have each activity listed row-wise. Each activity and its data will be listed as a vertical list, reversed chronologically (latest at the top) as per the activity's timestamp. The Activity Report page table will have the Name, Activity Description, Result, Activity Count and Attempted On columns. An Activity filter is also added to quickly search for an activity. 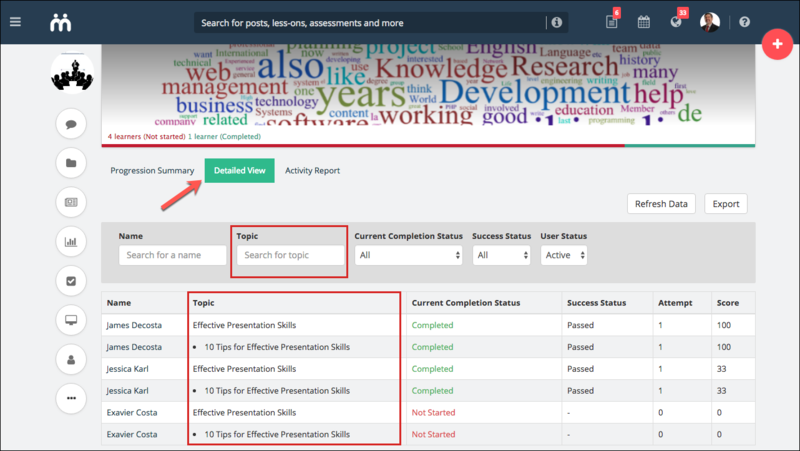 You can export the detailed view report of a SCORM lesson in an excel format. Let's see how. 2. You will be taken to the Progression Summary page. Click Export. Refresh the SCORM data by clicking the Refresh Data for latest data. 3. The excel sheet will be downloaded to your system. Open the excel file from your system. 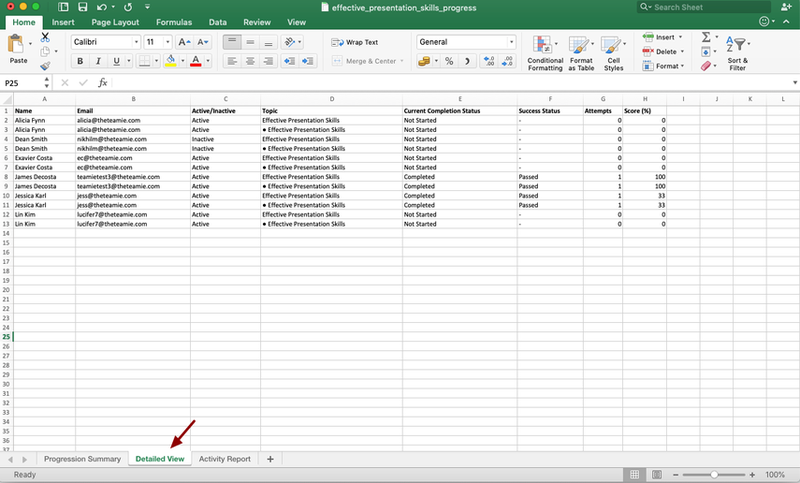 The excel sheet will contain the details for the Progression Summary, Detailed View and Activity Report in separate sheets. Using the SCORM bulk operations, you send reminders to learners as per your requirement. 2. You will be taken to the Progression Summary page. 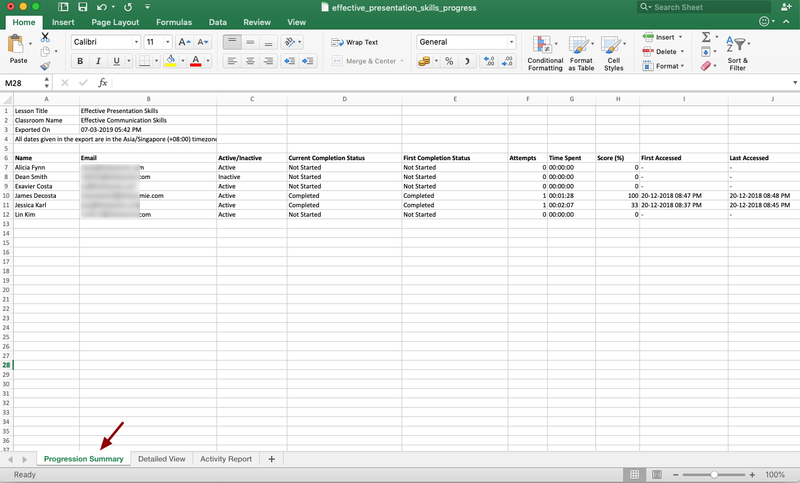 Click Select to do bulk operations checkbox. 3. All the learners will be selected. You can untick the checkbox of the learner(s) you do not wish to send reminders to. 5. Send Email pop up opens. Enter the required email body. 6. Click Send Email to send email to the selected learner(s).